"One man bucks the 'total death' trend"
What happens if the wrong person survives the Apocalypse? Not someone brave, heroic, or even trying to survive that hard? Just someone with a tenous grip on reality, trying to find enough creamed corn and peanut butter to make it through the day? Here's your chance to find out. Presented herein are the journal entires of one Carson Ira Cotterill, the man who survived past the End of the World As We Know It. Contrarion has not been tagged yet. 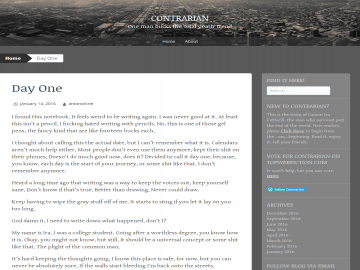 Help others find Contrarion by tagging it! Contrarion has not been reviewed yet. Contrarion has not been recommended yet.